The Texas Rangers once again showed why they have the best record in the American League. The American League West division leaders fell behind the Baltimore Orioles 3-0 Monday night at Globe Life Park in Arlington before rallying for the 4-3 win and extending their season-best winning streak to seven games. The team's last four wins have been by one run. 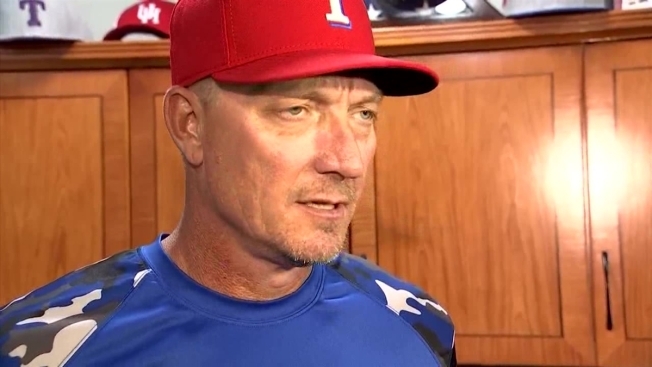 "Our confidence has continued to grow in what they've been able to do obviously," manager Jeff Banister said of the bullpen. "We know the kind of the struggles that we had earlier in the year, but these guys ... they're doing the things that we thought that they were going to be able to do coming out of spring training." Ian Desmond hit his 11th homer in the third inning, a 437-foot solo shot that landed halfway up the hill in straightaway center field. An inning later, Bobby Wilson ended a 10-pitch at-bat off Kevin Gausman (0-5) with a sacrifice fly. Shin-Soo Choo then hit a go-ahead two-run single to put Texas up 4-3. After former closer Shawn Tolleson (2-2) worked 1⅔ innings, Tony Barnette had two scoreless innings and Sam Dyson got the ninth for his 14th save in 15 chances, including 12 straight since taking over as the closer a month ago. "We all go out there and fight, and everybody in the bullpen's a stud in my opinion," Dyson said. Since the makeup of an April 17 rainout counted as a series, the Rangers stretched their club record to 10 consecutive series wins — the longest in the American League since Tampa Bay's 10 straight three years ago. The Rangers have the AL's best record at 46-25, their best ever through 71 games for a 9½-game lead over Seattle in the AL West. Baltimore is 40-29, a half-game ahead of Boston in the AL East. Texas is 17-4 in one-run games, the most such wins in the majors — and have won their last eight. Monday's win was the team's 23rd comeback victory this season, also tops in the majors. "Realistically, we had some opportunities that we didn't cash in," Orioles designated hitter Mark Trumbo said. "But on the flip side, we also got 15 hits. The offense was there. Maybe not as timely as we would have liked." Holland allowed 11 of the 23 batters he faced to reach base, giving up nine hits and two walks in 4⅓ innings. The left-hander struck out four. This was the Orioles' first one-game trip between home games since 1967, when they had to travel about 40 miles to play the Washington Senators, the team that in 1972 became the Rangers playing in Texas — nearly 1,400 miles from Baltimore. Two-time All-Star 3B Manny Machado remained in Baltimore for what was the second game of his four-game MLB suspension for charging the mound against Kansas City on June 7. ... Desmond had his 30th multhit game, second in the majors — and all after hitting .109 through his first 12 games with Texas. ... Wilson had another 10-pitch at-bat in the sixth. He struck out that time.